I'd heard about this new trend hitting a lot of bars in the states and I knew I had to have a try myself. Two of the greatest things on god's green earth combined into one tasty snack. You like beer? Good. You like fries? Good. Let's keep it simple - today we're making beer fries. Tip your fries into a bowl, big enough so they're below the rim. Do you know why? Can you guess what's coming? Of course you can. You rascal. Cover the fries with the beer, so that they're totally submerged. It's almost hard to do, pouring all of that beautiful beer into someplace that's not your gullet. Trust me on this one. Have I ever let you down? No. No I haven't. Let the fries soak for about half an hour, during which time they'll soak up about half of the beer. (In fact, they drink faster than a lot of my mates...wheyyyyyy). Drain well. Toss the chips with about 3 tablespoons of olive oil, a few minced cloves of garlic and a good pinch of sea salt and black pepper. Make sure all of the seasoning distributes well and then arrange on a baking tray. Bang them into a hot oven, about 220C should do the trick. Give the fries about 45 minutes in the oven to get like this. More or less depending on how you like them. In the Fatboy household fries are cooked one way and one way only - crispy. The darker, almost caramelised bit of potato skin lathered in seasoning and spices....that's just Flavourtown, USA. And the ridiculous thing about these fellas is that you can totally taste the beer, and it's amazing. The richness of the bitter absolutely comes through...it's a taste sensation. And a pretty bodacious one at that. Do people still say 'bodacious'? Has anyone who isn't a Ninja Turtle ever said 'bodacious'? Don't worry about it, I won't. And that's that. Beer and potato, basically. Pass me the ketchup. And another beer. I have to say these look proper scrummy. We used your recipe for Lamb Burgers yesterday(with a bit of cheese added) and they were to die for. We made the chunky oven cooked chips too, best I've ever tasted...so I will definitely be having a go at these! Do you have a good recipe/method for a stew done in a slow cooker? Hello! Thanks so much, really appreciate the kind comments. Love a good burger, what kind of cheese did you use? I don't have a stew as such, but you've made me want to make one now. A few of my earlier recipes would be great in a slow cooker, though. For the chili just add the beans 15 mins before you're ready to eat. Apologies for the extremely late reply....we just used plain old mature cheddar in the Lamb Burgers! Sounds great, I love a bit of feta with lamb personally. I only had dinner 10mins ago and now I'm hungry again thinking about lamb burgers!!! 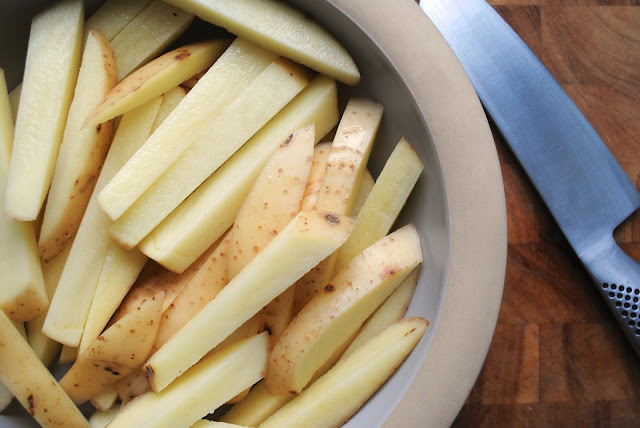 Have you ever tried baking fries on a cooling rack? It works really well! Potato + Beer. I'm a fan. The ultimate bar snack no? I haven't tried that..I will do now though! thank you! i definitely recommend them...beer and fries, what's not to love?